Won the 1901 AL Triple Crown for Pitchers. Denton True "Cy" Young (March 29, 1867 – November 4, 1955) was an American baseball pitcher during the 1890s and 1900s. Known by the nickname "Cy," short for Cyclone, Young was inducted into the Baseball Hall of Fame in 1937. Widely regarded as one of the greatest pitchers of all time, the Cy Young Award was created in 1956, one year after his death. Each year this award is given to the most outstanding pitcher in each league. Young set Major League records for most wins all-time, most losses all-time, most innings pitched all-time, most games started all-time, and most complete games all-time. His accomplishments and records can be attributed to his longevity, durability, and consistency. Many of his records stood for more than a century. Not much is known about Cy Young and his personal life other than he was born on a farm in Gilmore, Ohio. Young left behind little in terms of personal written documents, such as diaries or correspondence. Young was a quiet, unassuming, and well-mannered young man, a typical product of rural Ohio during the post-Civil War era. Denton True Young, the son of a Civil War veteran, grew up in the rural farming town of Newcomerstown. He dropped out of school after the sixth grade and began working on the family farm full time. As a teenager, Young's talent was known in town baseball circles and he eventually played a year for his first organized team, the Canton club of the Tri-State League in 1889. The only relationship Young had was with a childhood sweetheart named Robba Miller. Young wanted to wait until he had a thousand dollars in his bank account before asking her to marry him. They married on November 8, 1892. They remained married for the entirety of their lives but had no children. After his retirement at the age of 44, Young moved back to Peoli (Newcomerstown), Ohio, where he had a small farm. Young worked odd jobs to make money and sometimes took part in old timers’ games. Robba died in 1933. Young died in the same city he grew up in at the age of 88 in 1955. During his time with the Canton team, Young received the nickname "The Cyclone" and later it was shortened to "Cy." There are several different versions of how Young earned the nickname, however they all acknowledge that it is short for "Cyclone" and had to do with the speed of his pitches. One version says that while in the minor leagues with Canton, Ohio, the 6-foot-2, 210-pound right-hander warmed up by throwing pitches against a wooden fence and someone commented that the fence looked like a cyclone hit it after Young had completed his warmups. Another version states that it was a wild pitch that tore a couple of wooden planks loose from the grandstand and caused an observer to say that it looked like a cyclone had hit. The most common version of the myth is that Young received the nickname merely because his fastball was so overwhelmingly fast. During Young’s career, a tremendous amount of change occurred to the pitching rules. When Young first began pitching, pitchers were only allowed to throw underhand. That didn’t change until the mid-1880s. Most pitchers didn’t wear gloves and Young himself didn’t start using one until 1896. When he began as a pitcher, the pitching rubber was a pitching box that was 50 feet from the plate at its closest point and home plate was a diamond shape, which sometimes made it difficult for pitchers and umpires to differentiate a strike from a ball. The rules stated that a foul ball was not a strike. Many pitchers were affected by these rule changes, but Young and a few others adapted to the changes quickly. With the Canton team, Young compiled a 15–15 record before being offered a chance to play for a professional team. In 1890, the Cleveland Spiders offered Young the chance to play in the majors for the sum of $500. He debuted on August 6, 1890, against the Chicago White Stockings (now the Chicago Cubs), allowing only three hits and receiving the win. Young spent the ten years from 1890 to 1900 in the National League. For the first nine years he pitched for the Cleveland Spiders. Young was a reliable and durable pitcher who pitched games every other day. In October 1890, Young even pitched both games of a double header, winning both with 5–1 and 7–3 results. In 1892, he set his career high for wins in a single season with a 36-12 record. He also helped the Spiders to the National League Championship, then known as the Temple Cup, in 1895. In 1899, Young and the rest of the Cleveland team were transferred to the St. Louis Perfectos, who would become the St. Louis Cardinals the following year. In 1901, Young moved from the St. Louis Cardinals to the Boston Americans of the newly formed American League. Young again showed his consistency and durability by leading the American League in wins for three straight seasons between 1901 and 1903, with 33, 32, and 28 wins. In 1901, he won the Triple Crown for pitchers, which includes leading the league in wins, strikeouts, and earned run average (ERA). In 1903, Young led the Boston Americans to the American League pennant. That same year the Americans would play against the National League pennant-winning Pittsburgh Pirates in the first World Series. Young threw the first pitch in the first game of that World Series, but would get the loss in a 7–3 Pittsburgh win. Young would come back and win two games in the best-of-nine series (the World Series wasn’t reduced to the modern best-of-seven series format until 1922) to help his team win the series, 5–3. Young spent seven years playing for the Boston organization, which became known as the Boston Red Sox in his last year, 1908. During the 1907 season, Young even took up the role of manager while playing for the team. 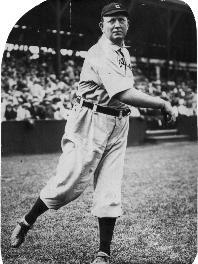 On August 13, 1908, the American League honored Young by celebrating Cy Young Day. On this day the league suspended all league games and brought an All-Star team to Boston stadium (then the Huntington Avenue Grounds) to play against Young and his team. Young pitched the first few innings and the game was interrupted several times to make presentations to him. His popularity brought nearly 20,000 fans to the park, while another 10,000 had to be turned away. 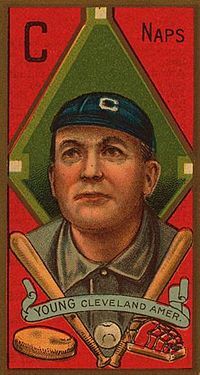 In 1909, Young was traded back to the Cleveland organization, now known as the Naps, and compiled a 19–15 record. In the following two years, Young, now in his 40s, earned only 14 wins. Midway through his last season in 1911 he was waived by the Cleveland Naps and then signed with the Boston Braves. Young did not return for the 1912 season. By the time he retired he had reached or topped the 20-victory mark 16 times and exceeded the 30-win plateau five times. On September 18, 1897, Young pitched the first no-hitter of his career. On that day, Young and the Boston Americans defeated the Cincinnati Red Stockings 6–0. On June 30, 1908, Young threw another no-hitter against the New York Highlanders in an 8–0 Boston win. In October, 1890, Young pitched both games of a double header, winning 5–1 and 7–3. This achievement is even more striking when contrasted with modern pitchers who usually pitch one game every five days. In 1901, Cy Young won the Triple Crown by leading the league in wins (33), strikeouts (158), and ERA (1.62). On May 5, 1904, Cy Young pitched the third perfect game in Major League Baseball history, the first in American League history, and the first of the twentieth century. A perfect game is defined as a game in which no batter reaches first base safely, thus no hits, walks, or errors can occur. Young struck out eight as Boston defeated the Philadelphia Athletics 3–0. Young’s perfect game came in the middle of a then-record 45 consecutive scoreless innings streak and the still standing 23 consecutive hitless innings streak. The next highest number of wins in a career belongs to Walter Johnson, whose 417 wins fall 94 wins short of Young's totals. The modern player with the closest number of wins is Roger Clemens with 348 wins. A player would need to average a little more then 25 wins a year for 20 years to catch up with Young. However, the last player to win more the 25 games was Bob Welch, who won 27 seven games in 1990. It is unlikely that this record will ever be challenged. There are actually many players close to Cy Young in the number of losses, Pud Galvin’s 310 losses place him second and Nolan Ryan's 292 losses is third. The fact that Young is so far ahead in wins but not in losses displays his outstanding talent. Young’s career record for losses is attributed to the shear number of games he pitched. Pud Galvin's 6,003.1 innings is second. The difference of 1,353 innings would be more than 150 complete nine-inning games. Next on the list is Nolan Ryan (773 games). With the modern five-day rotation now the standard, this is unlikely to be equaled. Next on the list is Pud Galvin with 646 games. The use of the "set-up man" and the "closer" to finish out games in the modern era makes this record practically untouchable. Roger Clemens' has the most complete games among modern players with 118. In 2005 and 2006, the league leaders in complete games had seven and six, respectively. In 1937, Cy Young was elected into the National Baseball Hall of Fame. This was the second year of the Hall of Fame and Young’s second year of eligibility. In 1956, one year after the death of Cy Young, then Commissioner of Baseball Ford Frick created the Cy Young Award. This award is given to the best pitcher in Major League Baseball as decided by a vote of the Baseball Writer’s Association of America. From 1956 to 1966, the award was given to only one pitcher. In 1967, it was changed to one pitcher from each league. In 1993 Northeastern University unveiled a statue of Young outside the Cabot Center, one of its athletic complexes. The statue stands near the location of the pitcher's mound in the old Huntington Avenue Grounds, the home field of the Red Sox in Young's time. In 1999, 88 years after his final major league appearance and 44 years after his death, he ranked number 14 on The Sporting News' list of the 100 Greatest Baseball Players, and was elected to the Major League Baseball All-Century Team, even though half of his career took place in the nineteenth century. For at least a portion of Young's career, statistics such as on-base percentage, sacrifice hits, and caught stealing were not yet officially counted, thus making his career numbers in those categories unknown. ↑ 1.0 1.1 1.2 1.3 1.4 1.5 Major League Baseball, Official Website. Retrieved March 30, 2007. There are some discrepancies between the official website of Major League Baseball and the National Baseball Hall of Fame website on the statistics of certain players. Thus, the official website of Major League Baseball was used for the statistics in this article. Answers.com, Denton True (Cy) Young. Retrieved March 30, 2007. Diskin, Bob. A Pitcher Worthy of a Trophy. ESPN.com. Retrieved March 28, 2007. Major League Baseball, Official Website. Retrieved March 30, 2007. McKim, Donald. Cy Young: A Life in Baseball (Review). Baseball Almanac. Retrieved March 28, 2007. The Official Website of Cy Young. Retrieved March 28, 2007. This page was last modified on 22 November 2017, at 17:24.